My recent trip to Romania has yielded a goodly number of images for future use both here, on Flickr, Instagram, Twitter and so forth. I had gorgeous light most of the time and almost perfect conditions every day. On my last morning I was in Bucharest on a whistle stop tour of the area we had stayed in the previous night. One or two of the images have sneaked through to hopefully give you a taster for the rest of the series, so you can see for yourselves what conditions were like. 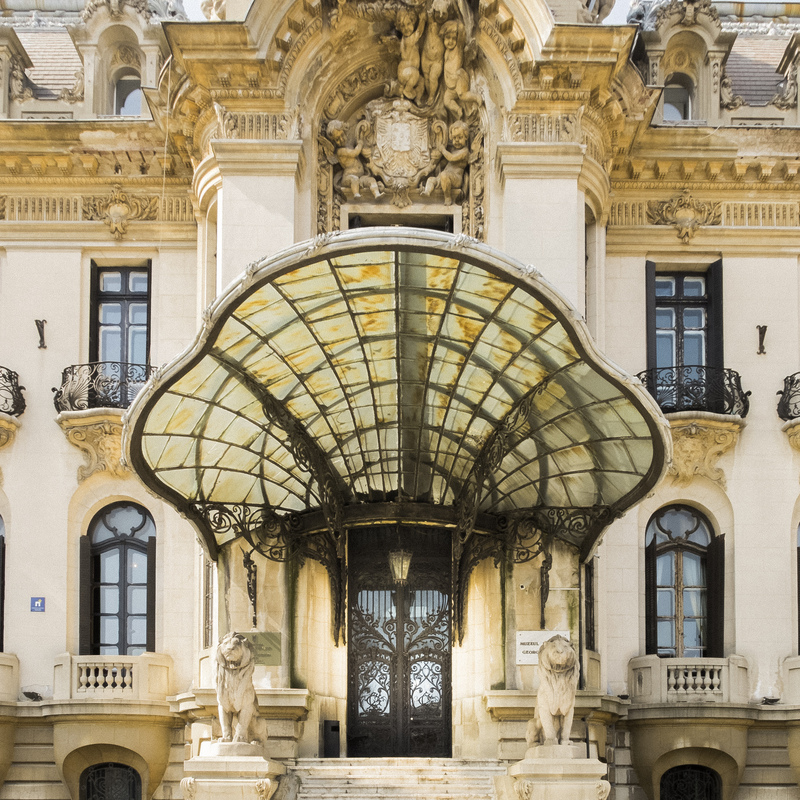 Walking back to the hotel to collect baggage, I saw the most remarkable building, which turned out to be the National Museum George Enescue, formerly the Cantacuzino Palace. Sadly, it was closed and it was sited on a busy main road with the remnants of rush hour traffic whizzing by. I was determined to get at least one image. Standing at the gate as close to the centre as I could, I set my X-20 to the widest lens setting and took a couple of portrait format images and hoped for the best. Now, I’m not a great believer in manipulating images but there are rare occasions when I really want an image to work. The two shots I’d taken were good but there were converging verticals and the image wasn’t quite level. There were a number of other things wrong, too. Using Lightroom I set about sorting the converging verticals. Lightroom’s tool for doing this is really good and works its magic in 99 cases out of 100. By using this process I lost the lovely upper part of the main entrance. I like square images and it was using that format that I finally got a decent image with some of the upper part of the building included but at the expense of losing the entry steps, which did make nice lead lines. Now all I had to do was correct the exposure – sandstone is notoriously bright and there was a lot of shadow detail to correct. Using two Lightroom tools to correct the shadows, I finally got an image that I was satisfied with. And, dear reader, here it is! It is not perfect but I am pleased with the result. This is so, so gorgeous!